Most Classic Hairstyle - Misc. Elvis' pelvis may have gotten all the gals to swoon once upon a time, but these days we can't help falling in love with his... 'do. In a Head & Shoulders survey of 4,000 Britons, Elvis Presley's shellacked pompadour nabbed the prize for most classic hairstyle, earning a whopping 50 percent of the vote, reports the Daily Express. Why thank ya, thank ya ver-uh muuuuch. The King -- who would have turned 75 this past January -- reportedly beat out David Beckham and mulleted British DJ Pat Sharp, who won 17 and 15 percent of the vote, respectively. And Brits aren't the only ones smitten with the late crooner's vertical hairstyle. As previously reported, Elvis-style pompadours ruled the runways at Milan Fashion Week. But don't bust out the teasing comb just yet, fellas. A supporting survey found that 66 percent of British women think crew cuts are sexier than big pompadours, according to the paper. Aw, girls -- don't be cruel! I think the old pompadour look was good in it's day back in the 1950s. I remember at the time that guys with crew cuts were considered how should I say, not very masculine. By the way this is not my personal opinion! Larry Geller, Elvis' personal hair stylist told me he too, likes the most Elvis' hairstyle during King Creole (pretty much like the above famous grease-style haircut/style). 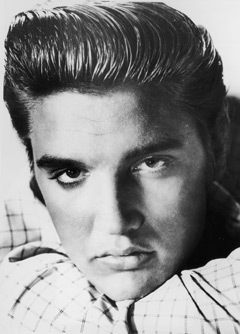 For the record: Elvis was not a crooner. He was a ROCKER.